"Creativity requires more than words to express the myterious depths of joy and sorrow in human experience. Words alone can't say what we feel about love, loss, death, wonder, and astonishment. I sculpt to express what I feel when words cannot say it. My sculptures are figurative and abstract ways of communicating about the meaning of human experience." 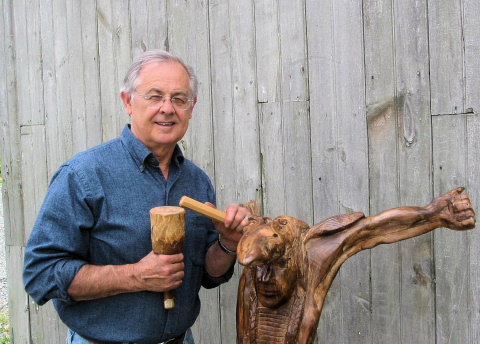 Charles McCollough presents his faith in creative sculpture in several media, including wood, stone, bronze, and clay. He is particularly noted for his many commissioned works reflecting Biblical themes and portraits for churches, seminaries, and individuals. He is the author of nine books, some with and accompanying DVDs, and has delivered many presentations on his theology and how it informs his art. The website has been updated to automatically expand or contract to fill the screen of the devise you are viewing it on. It is now mobile-friendly, but is best viewed on a larger screen. NEW BOOK (2019)! Read about Charles McCollogh's ninth book just published. We've added two new Galleries! Clay/Miscellaneous #2 and Clay/Other Biblical #2 feature pieces new to our website. We've also added prices for sculptures that are for sale in these two new galleries as well as the Clay/Advent & Christmas Gallery and the Bronze Gallery! Please read the wonderful reviews for Charles' recent Parables Class in Belfast and for Charles' newest book, "The Non-violent Radical: Seeing and Living the Wisdom of Jesus." © Copyright 2018, Charles McCollough. All rights reserved.